Historic New England is restoring the meadow across the street from Barrett House in New Ipswich, New Hampshire. Working with the Natural Resources Conservation Service and its Wildlife Habitat Incentive Program, our goal is to develop and improve wildlife habitat to encourage native pollinators and provide coverage for birds and other local species. In New Hampshire, most open space is dominated by either woods or short-cropped lawns and playing fields. Keeping certain fields clear of woody growth, removing invasive plants, and planting wildflowers has created a space that provides protection to birds and small mammals and is enjoyed by butterflies and bees. The restored meadow now contains coreopsis, vetch, daisies, black-eyed Susans, and red clover. 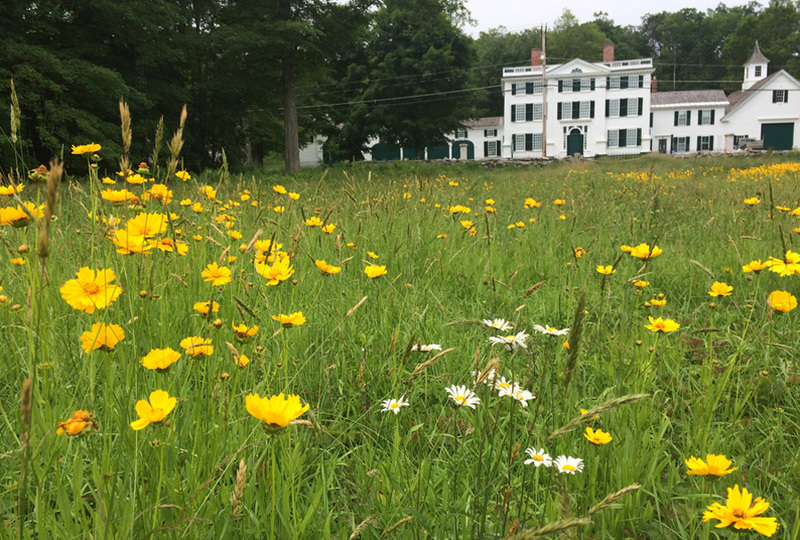 The meadow is just part of the more than seventy-five acres preserved at Barrett House. These include landscaped grounds, the terraced hillside, woodland, and now a beautiful meadow. You can see this wonderful space on the second and fourth Saturday of each month through October, when Barrett House is open for tours from 11:00 a.m. to 4:00 p.m. Plan your visit.